When my family started homeschooling more than three decades ago, we weren’t committing to homeschooling all the way through high school; at the beginning the idea was to take it one year at a time. It wasn’t until our older students were teenagers that we finally decided we could indeed homeschool through high school. From then on, the decision was basically made – to homeschool all twelve of our children all the way through to graduation. That didn’t mean that high school looked the same for all twelve of them, or that we didn’t make changes along the way. But we had at least made that initial decision about high school. As with all other aspects of homeschooling, there isn’t one right way to homeschool the high school years. And while our family decided, for the most part, to homeschool straight through to the end, that isn’t necessarily the decision that all homeschool families will make. But regardless of different family decisions about how long to homeschool, or how to homeschool, one thing we all have in common is that we want what’s best for our children! Because of that, we want to be the ones to direct their education – whatever direction(s) that education may take. I personally like to teach teens. They can generally listen well, read well, and argue well. Call it “discuss well” if it makes you feel better, but with teens the two are basically synonymous. At this stage, our students are well on their way to becoming independent adults, one of our primary goals for homeschooling (or, at least in my humble opinion, it should be!). 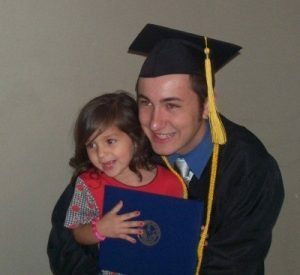 Our first (of 7 and counting) College Graduate with his youngest sister. High schoolers can handle much more of the load themselves than we give them credit for. (And there are a growing number of online resources, such as Kahn Academy, where they can do upper level work on their own.) But, remember, though, even when they can be self-taught, they are not necessarily self-motivated! Your job at that point may become more of a director than an actual teacher. Correspondence schools are another option that we’ve tried for high school classes. It wasn’t one of our favorites – but it did work. (My oldest got her high school diploma through The American School.) For some families it may be just the answer to these concerns. And last, but certainly not least, local colleges can fill in just about any other gaps in higher level high school classes. When my fourth child got to the Saxon Calculus book the summer before his senior year, he decided that while he could do it on his own, he didn’t want to, so he went to the local university and jumped through the hoops to enroll in their Dual Enrollment program. Since then I’ve had several children who did Dual Enrollment and/or Early Enrollment while in high school. It isn’t the answer for every student, but it certainly adds to a family’s options. I can’t leave the topic of college without addressing one of my personal concerns after so many years of homeschooling. One of the growing trends seems to be for homeschoolers to rush their kids through their schooling and graduate them early. But I have to ask, why do we want to be in such a big hurry to graduate our students? They certainly aren’t lacking for subjects that they can study at home. What do we gain and what do they gain by rushing the process, versus what is lost – more time with their family; more time to mature; more time to pursue special interests? There are exceptions, of course, but I think home schoolers would do well to rethink this trend. So, as you look forward (or at least ahead) to the high school years, please remember that home education equals parent-directed education. Helping find the right places for them to study the subjects that they need is an important part of our everchanging role in their lives, even when we are phasing out of being their primary instructors. (When and how that happens will vary between families, and often between students within a family.) We should be anticipating the time that they graduate and move on to their own lives, and we can start that process slowly, rather than the day they are handed their diplomas. How to award credits for high school classes is another big, but mostly needless, concern. I know of two accepted standards for awarding a credit. Logging approximately 120 – 150 hours in a specific subject – reading, discussing, listening to lectures, writing about it, and watching related videos all count towards the necessary time. I found the book Design-Form-U-La to be very helpful when we started keeping these kinds of records, though sadly that book seems to be harder and harder to find. Our family granted most credits based on the “hours logged” in a subject, rather than through textbook completion, since we used so few textbooks, even in high school. Textbooks are not totally bad – but they are so two-dimensional! I cover more about that in my blog post, Homeschooling through Topical Studies. 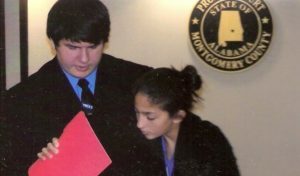 All of my children did Mock Trial one or more years! And students can receive high school credit for work done before high school, in seventh or eighth grade, if it’s high school level work. Transcripts also intimidate many folks – but they’re really easy to do. The standard way is to break courses up by school year, one section for the freshman year, one for the sophomore year, etc. But in our family, we preferred to show them by subjects instead, with all the English classes listed together, and then the math, and then the science, etc. Like so much else, it’s easy to find samples to look at with an online search. Transcripts need to include the student’s name, date of birth, and school years covered. Each class listed should include the general subject it was in (such as science), followed by the specific Course title (such as Biology), a grade, and a credit (usually ½ or 1). Not too complicated. I hope this has helped you feel a little less intimidated by homeschooling through high school. This is an exciting time to be sharing that time with your children who are on their way to becoming adults. In my book, Teaching Teens, I go into these and other related topics a bit more, as well as give example forms for counting credits, tracking grades, and making transcripts. Teaching Curriculum versus Learning Curriculum?